In a few days time, Manu will face the greatest threat to her life imaginable. She will give birth for the first time. We watch as Manu does the daily chores and attempts to access healthcare for her unborn child. 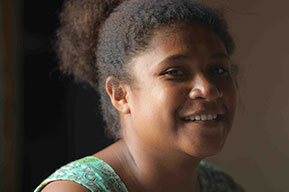 Manu is at high risk, like many girls her age in Papua New Guinea, of maternal mortality –the biggest of killer of girls under 18 around the world. Coming of age in Papua New Guinea is motherhood, but the reality is it could also mean sickness or even death from the complications of childbirth. We follow Manu as the labour pains take hold while she makes the journey into town to one of the busiest maternity wards in the world. Here other challenges arise such as a poor health system, low morale amongst the staff and too many women waiting to give birth. Will Manu and her baby survive this life and death lottery.